Add protection from the elements and road debris along with a finished look with these deluxe molded splash guards (part numbers 82210233 front, 82210232 rear) for the 2007-2018 JK Jeep Wrangler. 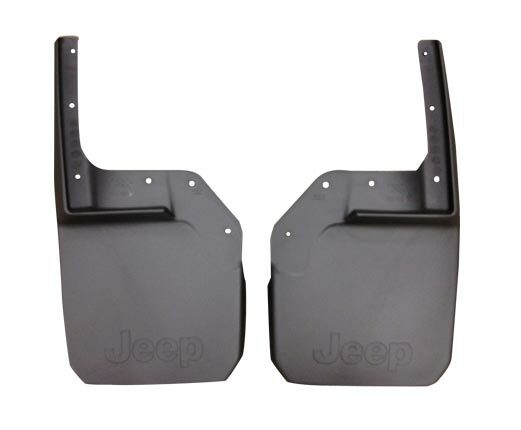 These splash guards are made with a strong and rigid composite plastic material that can be left black or painted to match your Jeep. They are molded to fit your Wrangler perfectly. They're sold in sets of two for front or rear mounting. 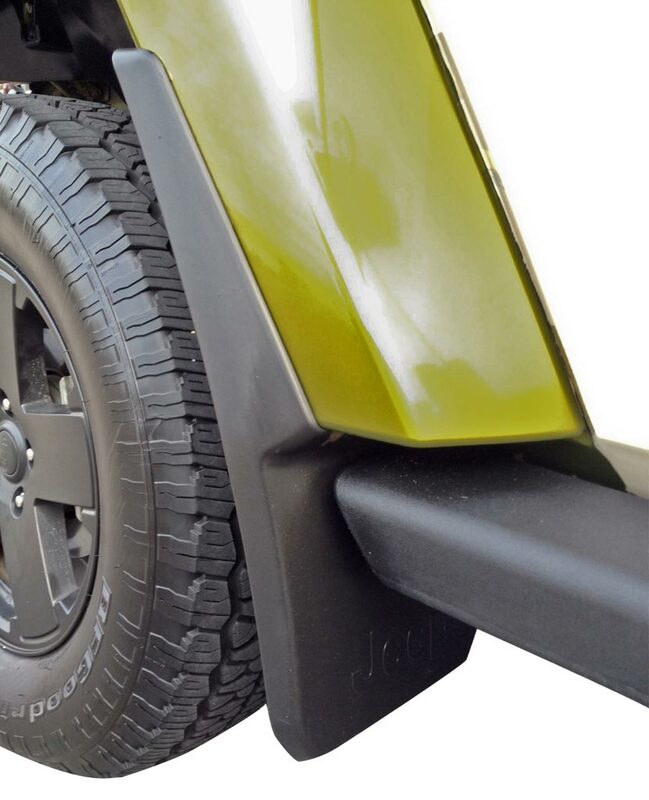 The rear splash guards will not work with metal, off-road or tubular rear bumpers. 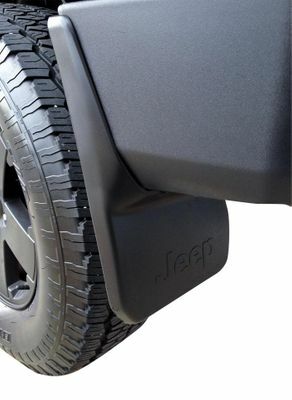 The rear splash guards will only work with the standard all-plastic factory bumper. For more information on installation see the front and rear installation guides. I haven't put them on yet. But they look great and I like that they have the Jeep logo on all four guards. I may up date this after I have them on. These mud guards are made by Chrysler Corp. and fit perfectly. They're molded to fit around the front wheel flares and the rear bumper. Installation is simple if you have basic skills in the use of tools. Drilling is required as well as the removal of some of the plastic rivets for the front guards. All hardware and instructions are included. I completed the installation in less than thirty minutes. The finished product looks great and works well. Extremely pleased! better with clearer/larger pictures as to state metal clips must be slide over the front mud flaps as the threaded hole in the clip goes over the actual hole in mud flap- which I knew having put on many mud flaps on other vehicles over the years. ProsNice fit as well some body protection from mud, road salt ( winter), small rocks, etc. I've had the splash guards on for about a week. They were easy to install (I did take the front tires off), and the directions were simple and clear. The splash guards look great and fit well. I'm pretty sure I'll be taking them off for wheeling next year--I don't think they'll stay on long on the trails, but they'll be great for keeping winter road spray off the door handles. I had to take the front tires off to install. They look good and work very well. The instructions were straight forward and everything fit like it was supposed to. Perfect fit and very easy to install. I am happy with my purchase to date. I am not sure how useful the rear guards will be but the front ones are doing a great job keeping dirt off my running boards. 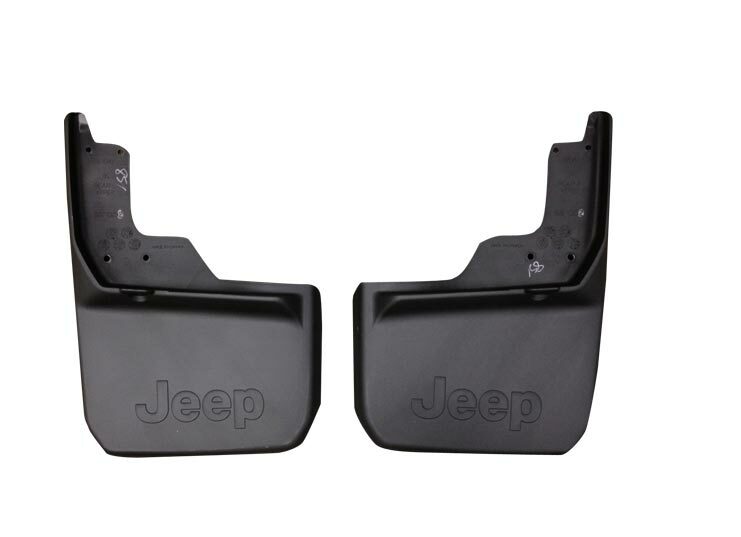 Ordered these from just for jeeps, they were on my doorstep within three days with free shipping. Saved over $25.00 instead of ordering from the dealership here in town. Well made, very easy to install, great instructions. The people from customer service at just for jeeps were also very , very helpful. steve - Evansville In. Well made and easy to install. No need to remove the wheels to install the guards.